Happy Halloween! I'm typing this post as I answer the door for trick or treaters. I especially love seeing the little ones. It's so chilly here this evening. It's currently 55 degrees, but started off at only 34 degrees this morning. Tonight is supposed to get down to only 30 degrees so I harvested my last 2 ichiban eggplants growing out back so they wouldn't freeze. Our high temp for Saturday is 52 degrees which is a drastic drop from the 70-80s we've had the last couple of weeks. I can't believe tomorrow is the first day of November. I took off from work a little early this afternoon so I could get dinner made and get ready for the trick or treaters. I made my Spicy Pumpkin Sausage Soup, but updated the recipe a bit. Rather than add sliced cooked sausage links to it, I browned bulk chicken-apple sausage (from Sprouts) and increased the chicken broth and heavy cream. I made a few other minor tweaks and it was the best ever. 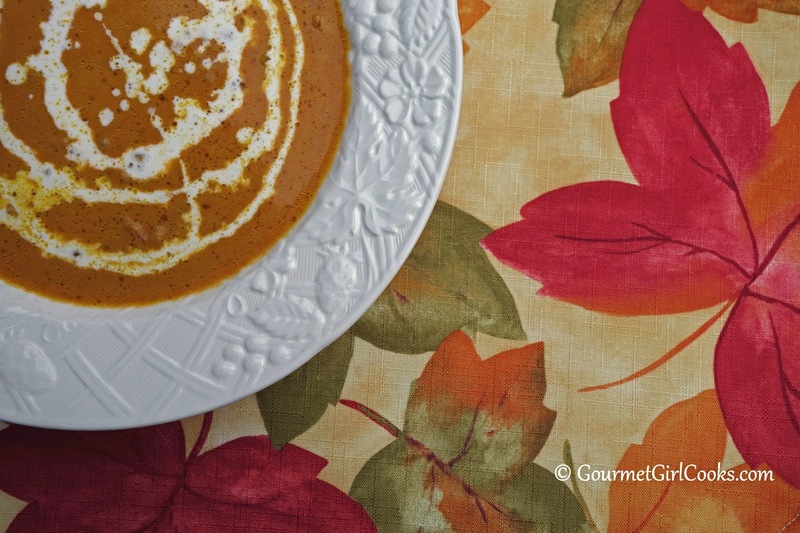 While some may wince a bit at the thought of pumpkin in their soup...if you think of it as a squash, it isn't sweet unless you add sweetener to it. The soup is so very simple and is ready in less than 30 minutes. The blend of flavors from the chicken apple sausage, chipotle and pumpkin went so well together and had all the flavors of fall. 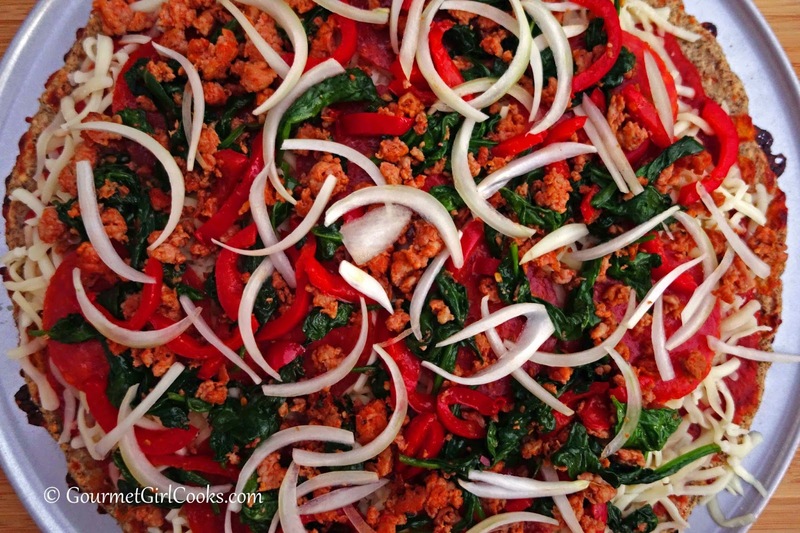 You can use your favorite sausage and you can choose to make it spicy or not spicy to suit your own taste. 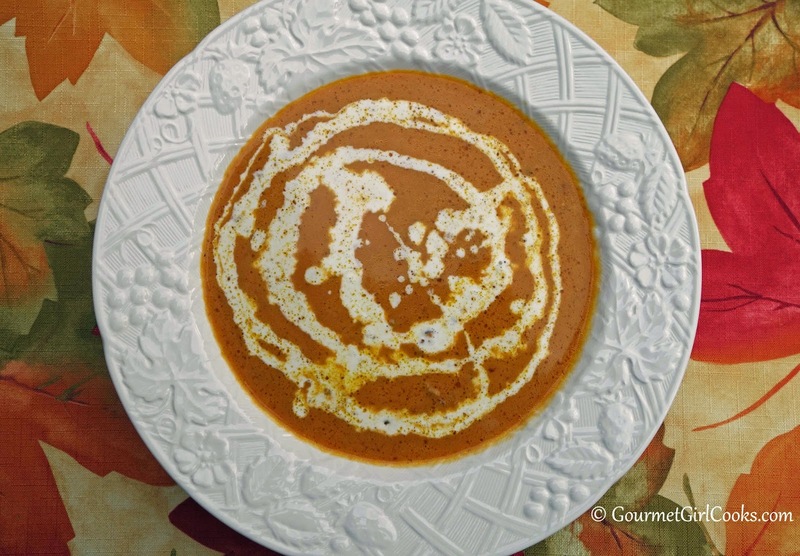 This soup is thick, creamy and rich; just like a bisque type soup, only with sausage in it. 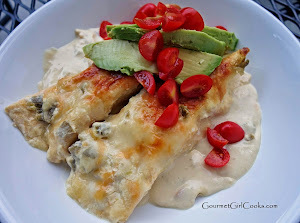 I snapped a couple photos for you to see below as well as my updated recipe. Enjoy! This evening I had to run some errands after work. 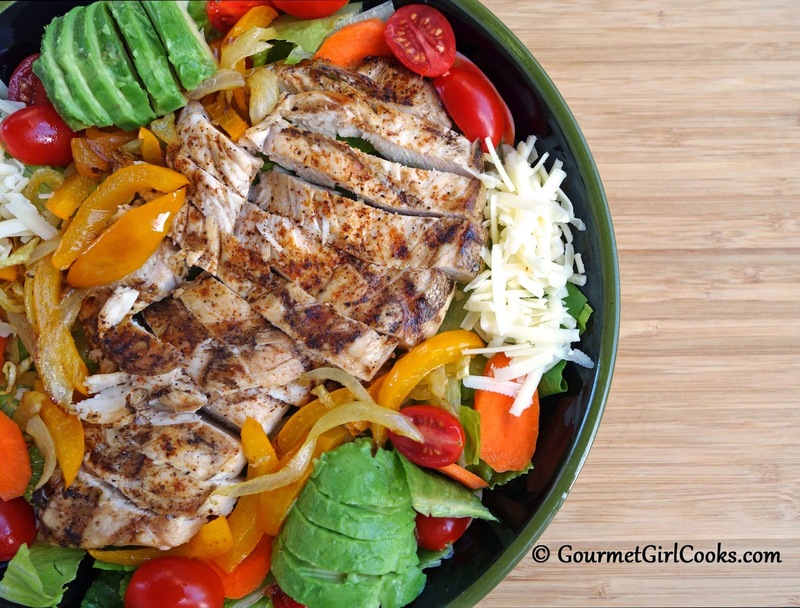 To keep dinner quick, simple and delicious...I picked up a rotisserie chicken and a bag of "Sweet Kale 7 Superfoods Salad Mix." It's actually a salad kit that comes with poppy seed dressing and dried sweetened cranberries and toasted pumpkin seeds to sprinkle on top (bagged separately from the salad mix). 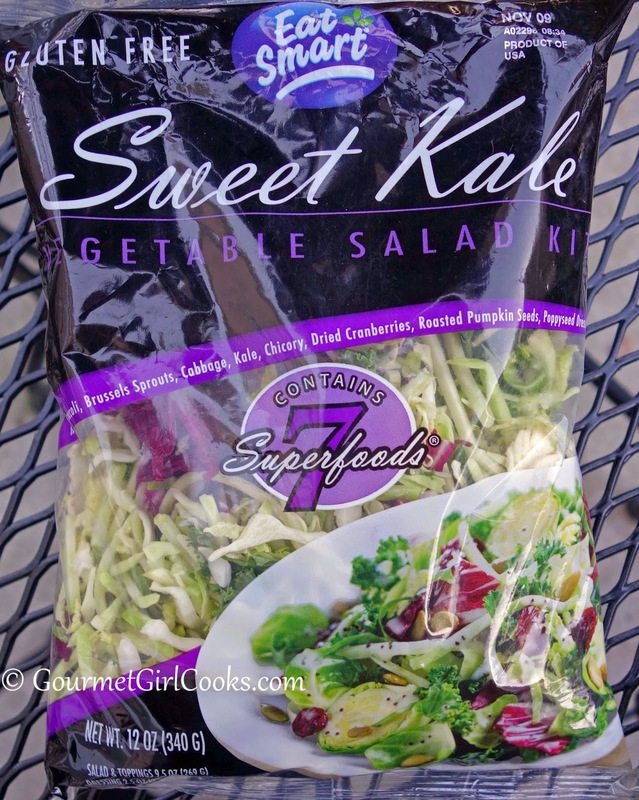 The salad mix is a blend of Broccoli, Brussels Sprouts, Cabbage, Kale and Chicory. I believe it's the same kit I see at Costco in a larger bag, but this was a smaller 12-ounce bag that was perfect for 2 servings. Since the dressing is made with sugar and soybean oil, I wanted to use my own dressing instead. I let hubby use the sweetened cranberries and roasted pumpkin seeds that came with the kit on his salad and I put some raw pumpkin seeds I had on hand on top of mine. 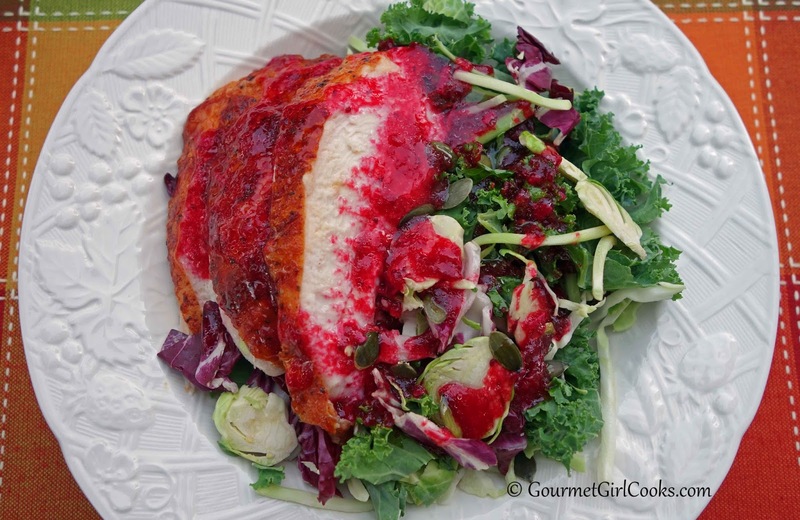 To add cranberry flavor to my salad without the added sugar of the sweetened cranberries that came with the mix, I decided to make a quick and easy vinaigrette with my fresh cranberry sauce. It turned out really good. I added olive oil, onion powder, sea salt, a dash of chipotle powder and some apple cider vinegar for bite to balance the sweet-tart flavor of the cranberry sauce. I tweaked and adjusted the seasoning a little after combining the ingredients. I poured the dressing in a little glass vinaigrette shaker bottle that I bought with a Good Seasons salad dressing mix. I tossed the dressing packet and kept the bottle to make my own dressing in. I like this bottle because it has lines and marks for oil, vinegar, etc. 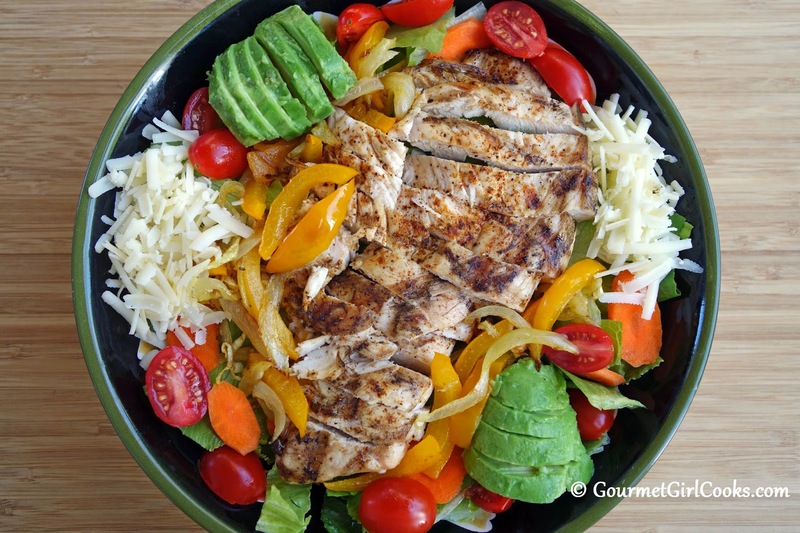 to make different dressings as well as a tight fitting lid so you can shake it up. 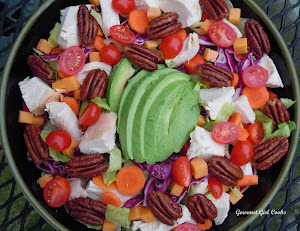 The cranberry vinaigrette was delicious on this salad mixture, along with the chicken. 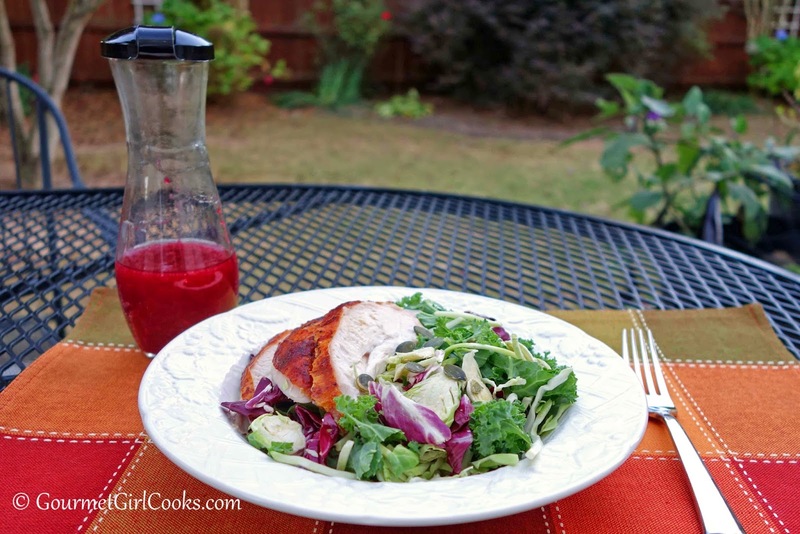 I snapped a couple photos of our easy peasy dinner and included the recipe for my easy Cranberry Vinaigrette. Enjoy! 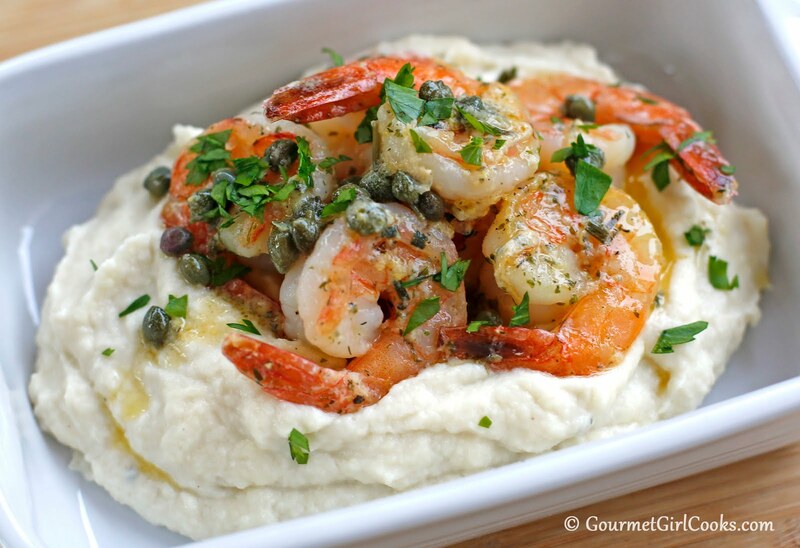 Whisk all ingredients together in a small bowl until blended and emulsified. Taste for seasoning and adjust, to taste. Refrigerate any leftover dressing. This evening I needed to use a package of ground sirloin I had in the fridge. I wanted to keep it simple. 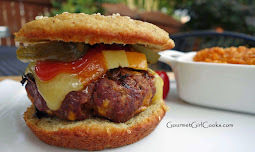 Since I had just baked a batch of my Sesame Seed Sandwich Buns last night, it was only natural that I gravitated towards making burgers to enjoy on them. 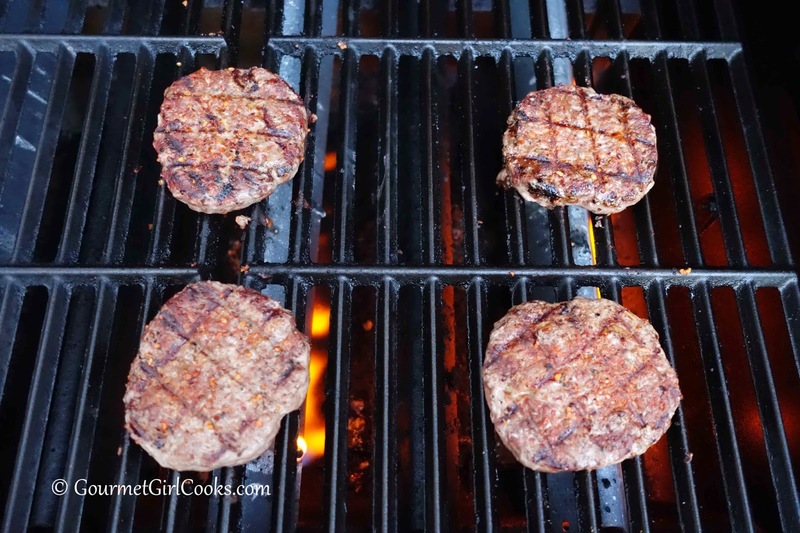 I made simple plain sirloin burgers and seasoned both sides with McCormick's Chipotle & Roasted Garlic Seasoning and then grilled them. I placed the burgers on a bun and topped them with sliced Baby Swiss Cheese and a dollop of...fresh Cranberry Orange Sauce! I decided that whoever created ketchup by sweetening pureed tomatoes obviously must not have had cranberries available, or certainly they would have created a condiment using them instead! It was actually good on the slightly spicy burgers. Even hubby liked the fresh cranberry sauce on his grilled chipotle burger instead of ketchup...and he isn't anywhere near as big a cranberry lover as I am. These burgers will have you singing "Cheeseburgers in Cranberry Paradise." LOL I snapped a couple quick photos for you to see below. I served my burger with a side of fresh avocado sprinkled with sea salt...it was awesome. Enjoy! This evening I made pizza (again) for dinner. 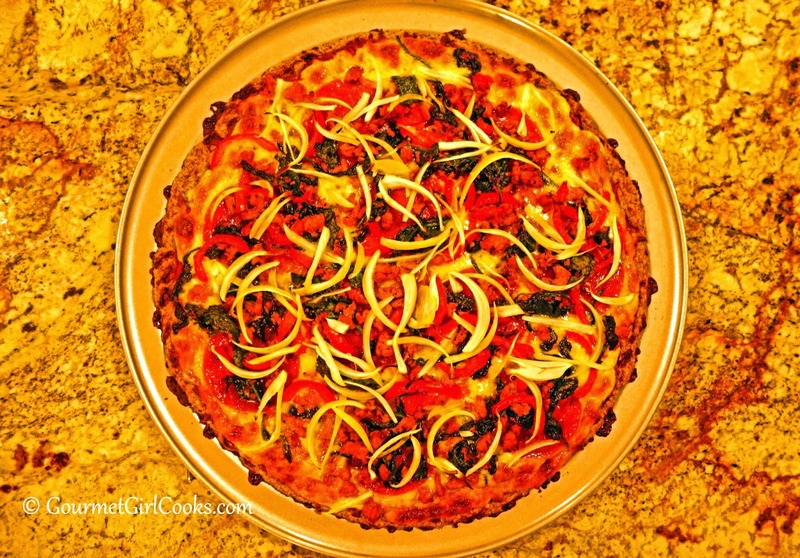 I enjoyed it so much last Friday night that I not only made another pizza...I doubled the crust recipe and made a BIG pizza...14-inches in diameter! 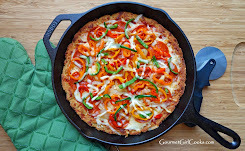 I have a 14-inch pizza pan but usually only make a 10 to 12-inch pizza. I wanted to have plenty of leftover pizza for lunches this week. 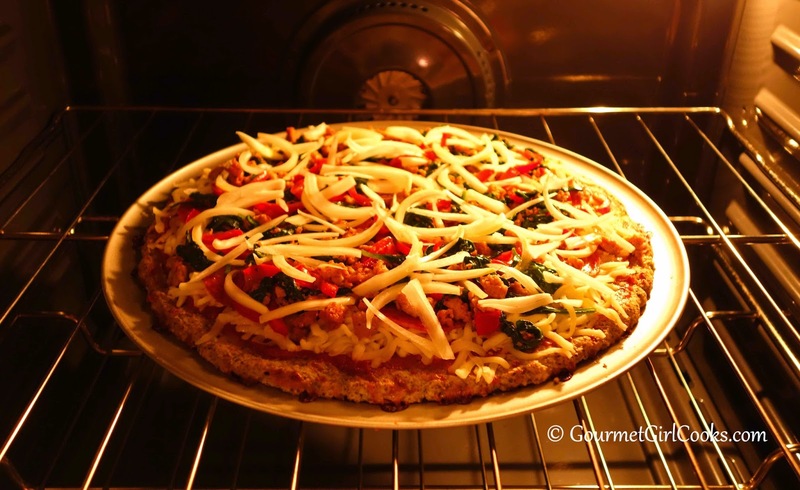 This makes a large family sized pizza when doubling the recipe. 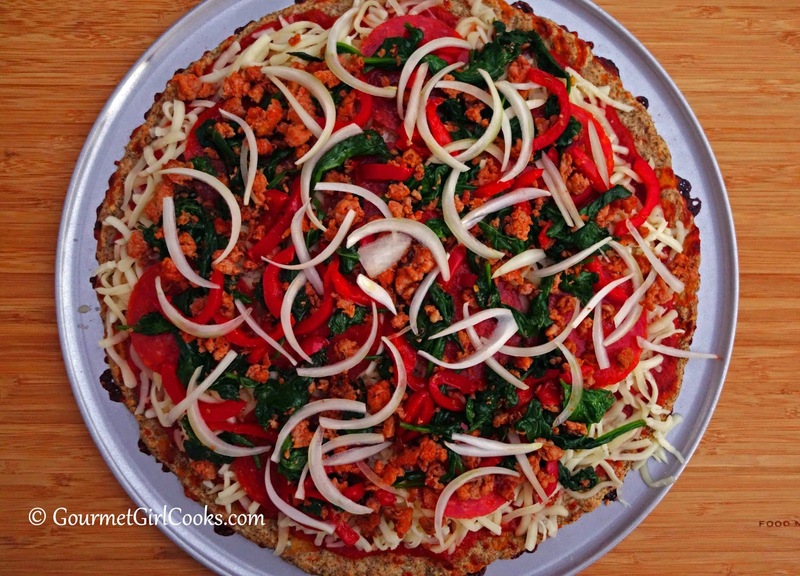 I used my no-flax version of pizza crust and topped it with browned spicy Italian chicken sausage, Fiorucci nitrite/nitrate free pepperoni, red bell peppers, onions and lightly sauteed fresh organic baby spinach. It was awesome and I have enough left for lunch the rest of the week. I snapped a few photos for you to see below. 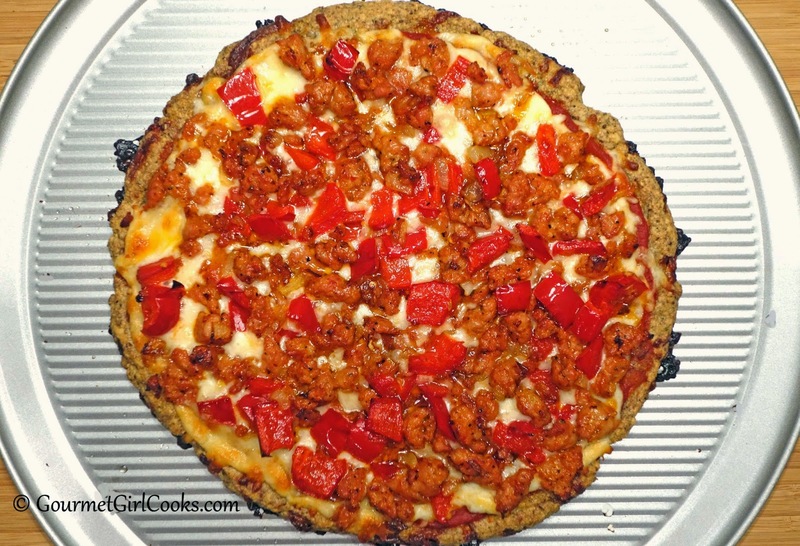 This is the pizza recipe that I doubled to make a 14-inch round pizza: Low Carb Herbed Pizza. I snapped a few photos of my jumbo pizza below. If you want to make a large pizza and don't have a big round pan, you can use a cookie sheet instead. Enjoy! Yesterday I decided to experiment a bit with my chocolate chip cookie dough recipe. 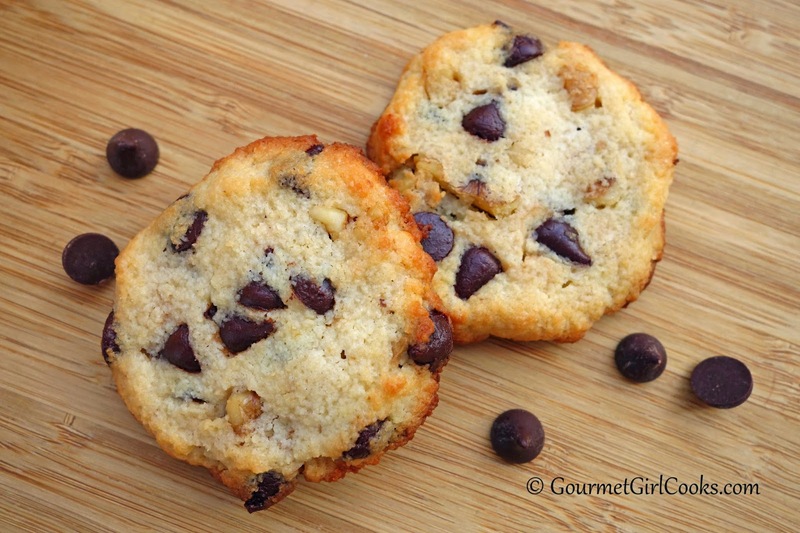 I wanted to see if I could tweak it a bit to create a crispy style chocolate chip cookie. I absolutely love my regular Chocolate Chip Cookies but I've had several requests from folks about a crispy version, too. 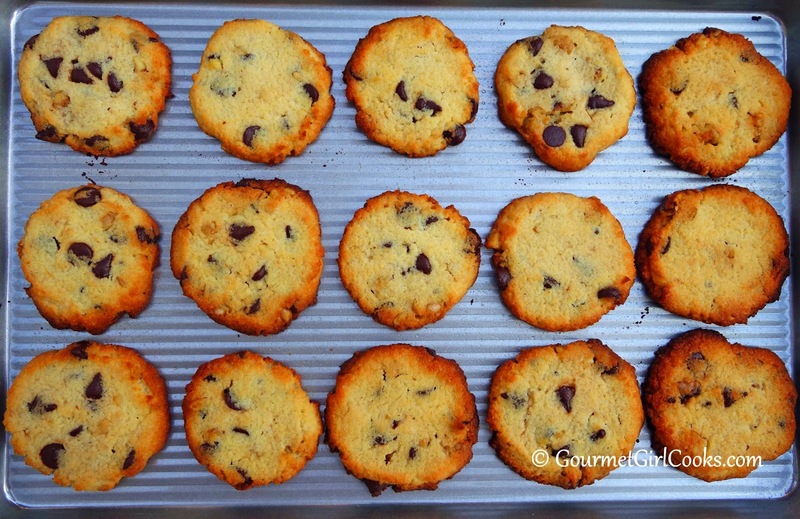 Some like their chocolate chip cookies nice and soft and others like them more thin and crisp. 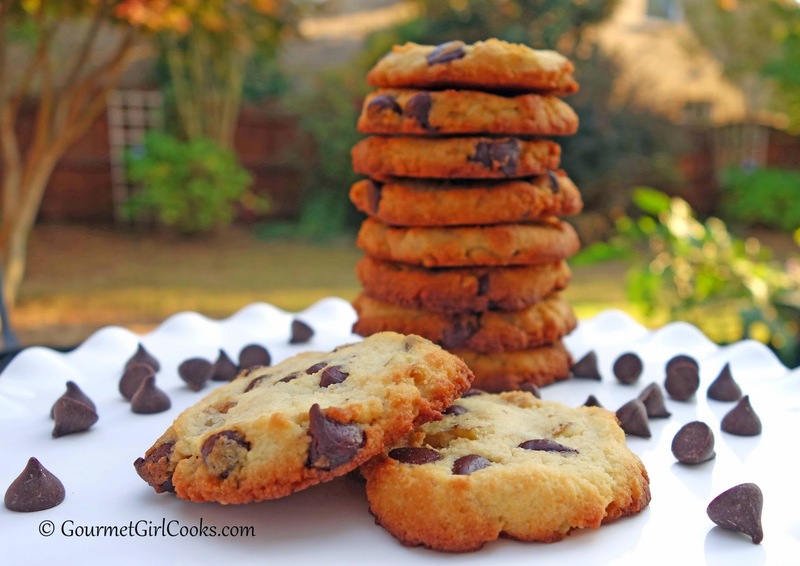 So, here's my version of a more crispy style chocolate chip cookie! I tweaked the balance of cream cheese and butter and boosted the almond flour a bit. I test baked several to get them "just right." Whenever I am testing a cookie type recipe, rather than bake an entire sheet of them, instead I bake a couple at a time to adjust temperature, bake time, flatten vs not flattening, etc. This time, I also baked them on different baking sheets to see if that made any difference. I baked a batch on my USA Pan baking sheet which created nice crisp golden brown cookies in about 13 minutes at 350 degrees. It's surface is corrugated so air can circulate underneath them because they don't sit on a totally flat surface. I did not have to grease the USA pan (its very nonstick naturally). I also baked a dozen on a standard heavy weight baking sheet lined with parchment paper. It took about 15 minutes to create a nice crisp golden cookie. There was not a significant difference between the two pans but the USA pan version might have been a tad more crisp. I baked a couple cookies at 350 degrees and a couple at 375 degrees. 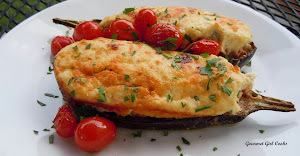 They did best at 350 degrees because the bottoms browned too quickly at 375. 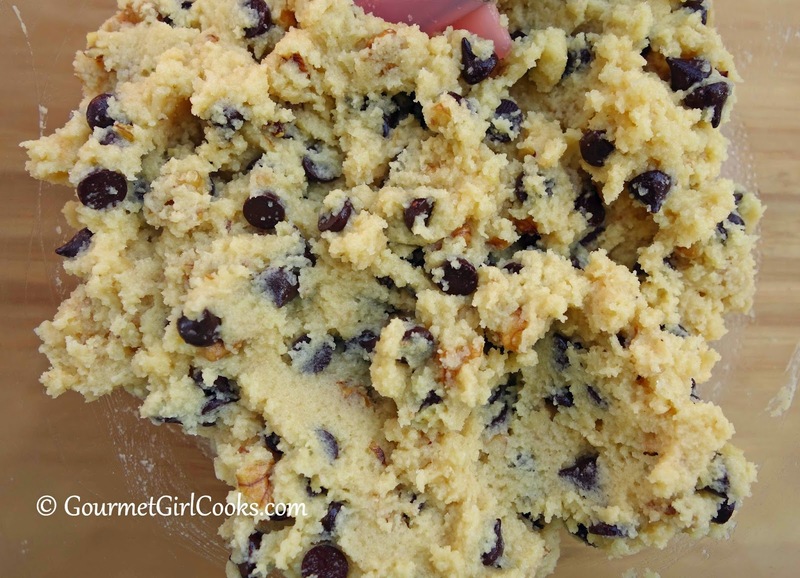 I used a 1-tablespoon retractable scoop to scoop my cookie dough onto the pans and then pressed the dough to about 1/4-inch thick with my fingertips. The cookies don't spread much and will be very close in size after baking. Using the retractable scoop gave me 3 dozen medium sized cookies. This time I also used my new Equal Exchange organic 70% chocolate chips in my cookies instead of chopping a chocolate bar into chunks. I picked up a bag from Whole Foods not long ago and then found them a bit cheaper at Amazon. I liked them so much I ordered a box of 12 bags...LOL. If you haven't tried their chocolate bars yet, they are worth trying. They are awesome and are currently my new favorite chocolate bar. I have tried their 71% bar and their 80% and both are good but I prefer the 80%. It's organic and fair trade. I am able to find these chocolate bars at my local grocery store but for some reason they don't carry the chocolate chips. While I don't mind chopping a chocolate bar to make my cookies, I won't lie, it was quite convenient having the chips to just measure and dump into my dough. I have enough chips with the 12 bags of them to carry me completely through baking season and probably then some! 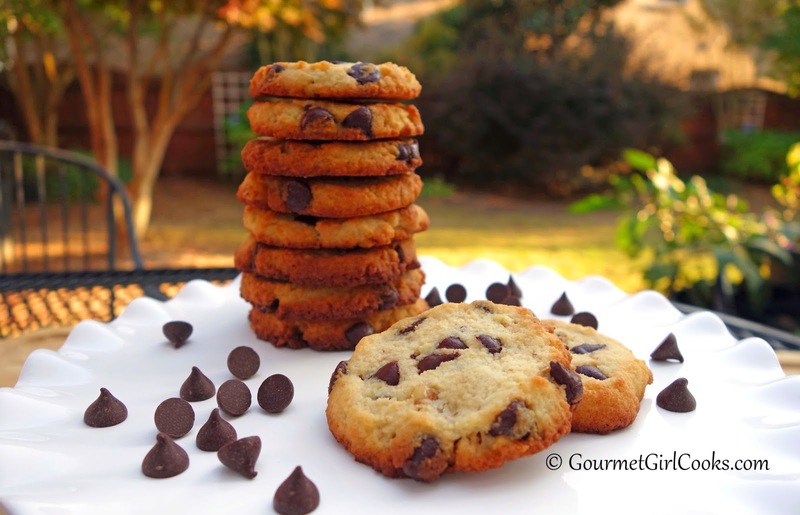 I snapped a few photos of the crispy chocolate chip cookies for you to see below as well as the recipe. Enjoy! Happy Sunday! This morning, as I was making breakfast, I made a triple batch of my fresh Cranberry Orange Sauce w/ Coconut (the coconut is optional). 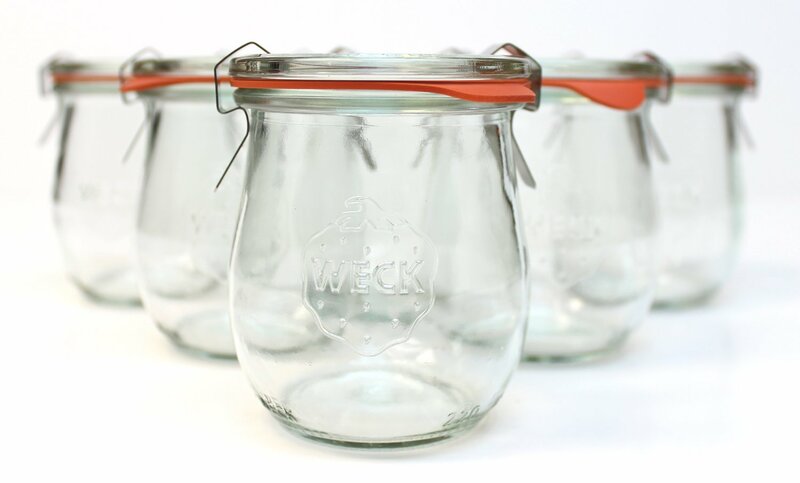 I absolutely love it and find all kinds of things to use it with and for. When I got back home after grocery shopping this afternoon I was a little hungry. 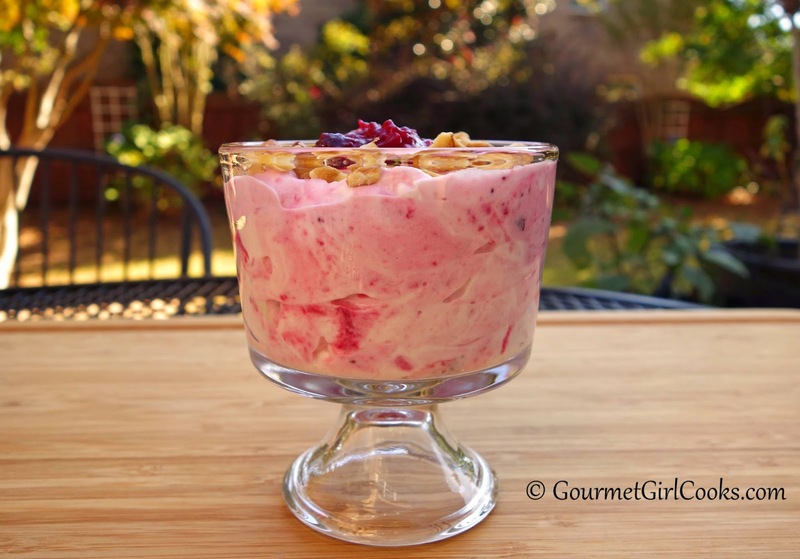 I usually don't eat lunch on the weekends but late this afternoon I made myself a quick and easy little Cranberry Walnut Parfait using an individual sized cup of Fage 2% Greek Yogurt, a couple tablespoons of my fresh cranberry sauce and a few chopped walnuts. It was amazing! I have found yet another way to enjoy cranberry sauce. 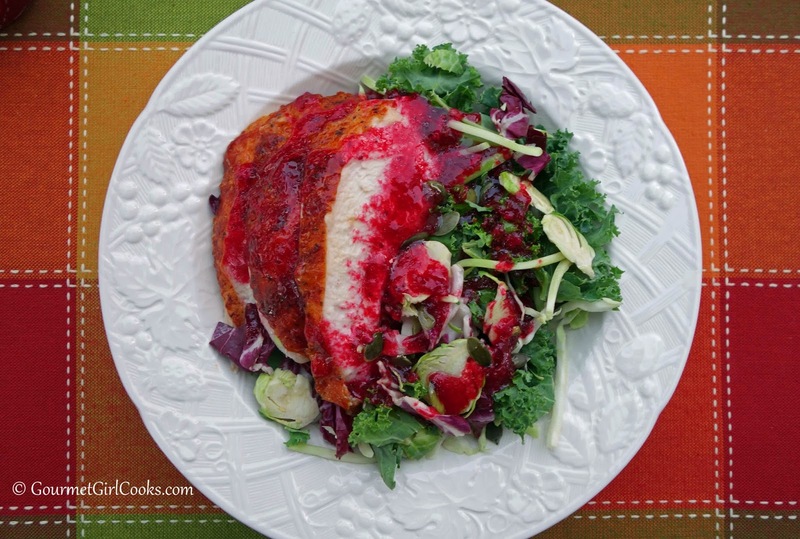 It's such a shame to limit cranberry sauce to a little dollop on your plate at holiday time. 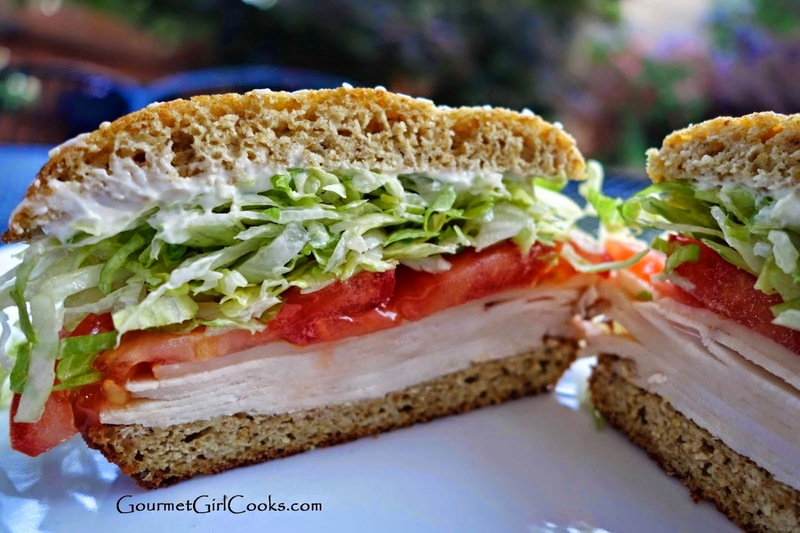 I like it beside almost any kind of meat at dinner time or a little dollop alongside eggs for breakfast or as jam on a power bagel with butter or peanut butter. There are so many ways to enjoy cranberry sauce that it deserves more recognition than it gets. 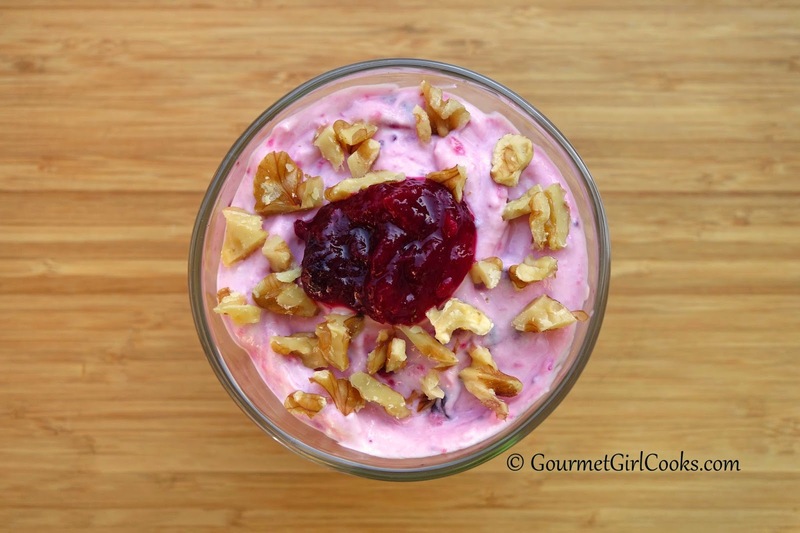 Check out my little yogurt parfait swirled with fresh cranberry sauce and walnuts. It tastes more like a dessert than a healthy cup of yogurt with fruit. Enjoy! This evening hubby was had a conference he was attending until late in the evening, so it was just me for dinner. 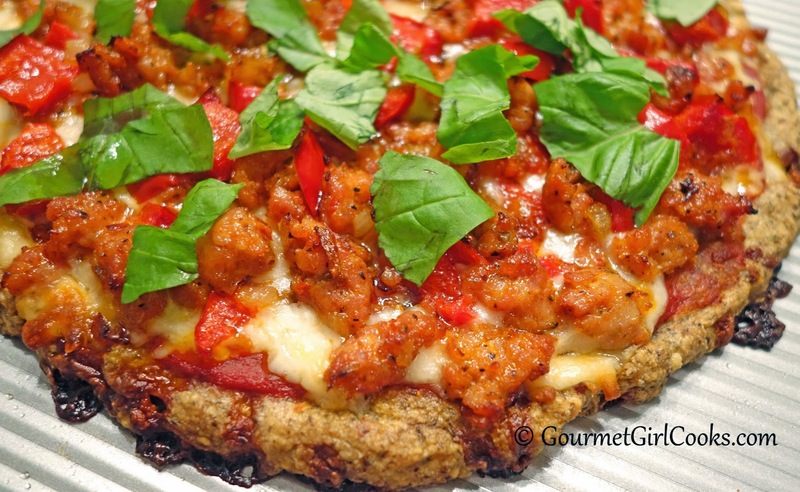 I went to Sprouts on my way home from work and picked up some fresh hot Italian chicken sausage (they make it fresh in-house without any MSG, nitrites or nitrates), red bell peppers, onions and fresh basil so I could make myself a pizza for dinner. When I got home, I removed the sausage from its casing and browned it along with some diced onion and red bell peppers. While they were browning, I quickly mixed together the dough for the pizza crust. 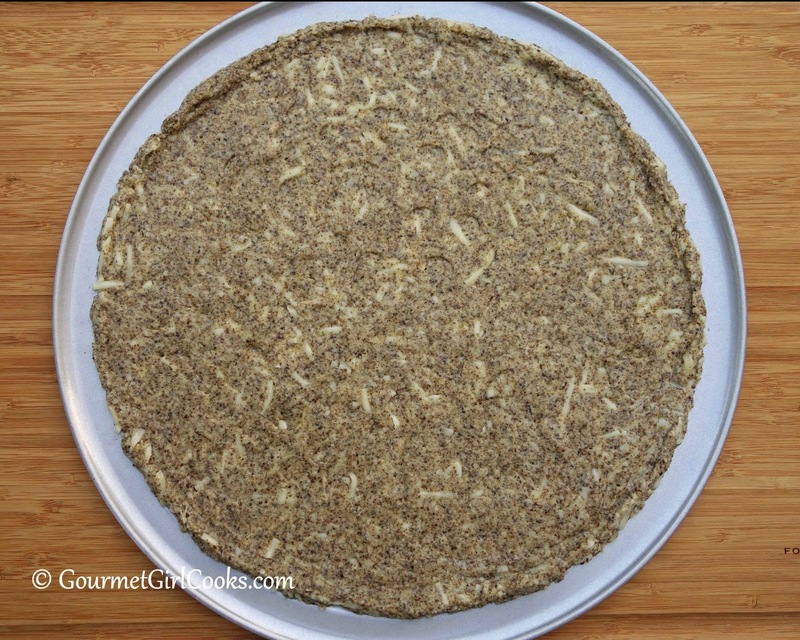 I made my no-flax version of pizza crust, and the little tweak I did made it the best ever. 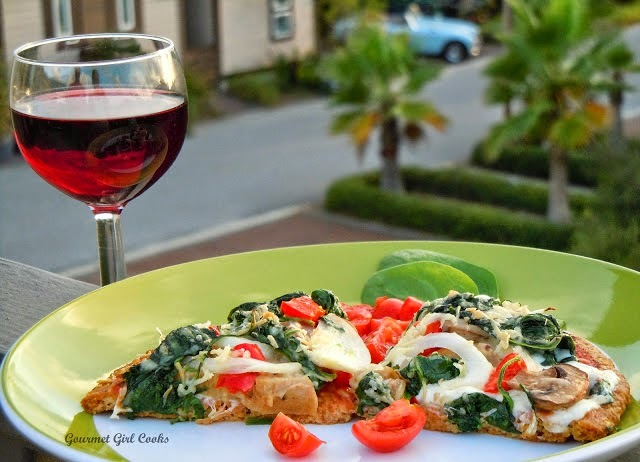 Tonight, I mixed about 1/4 cup shredded mozzarella cheese into my dough and it turned out awesome (I've included that addition to the recipe as optional, but unless you are opposed to adding it, its worth adding). 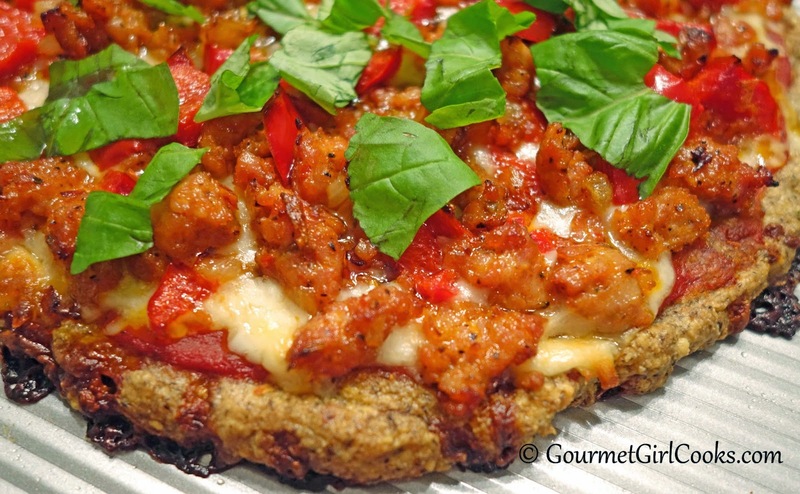 The mozzarella cheese browned and crisped in the crust and I loved the texture. 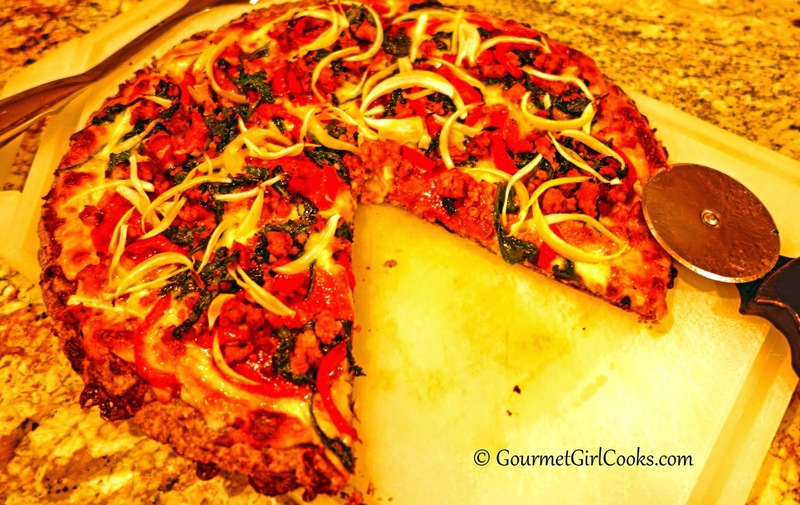 I topped my pizza with fresh sliced basil after pulling it out of the oven. This pizza was definitely one you could pick up and eat with your hands...no fork required at all and my pizza had heavy toppings piled on! 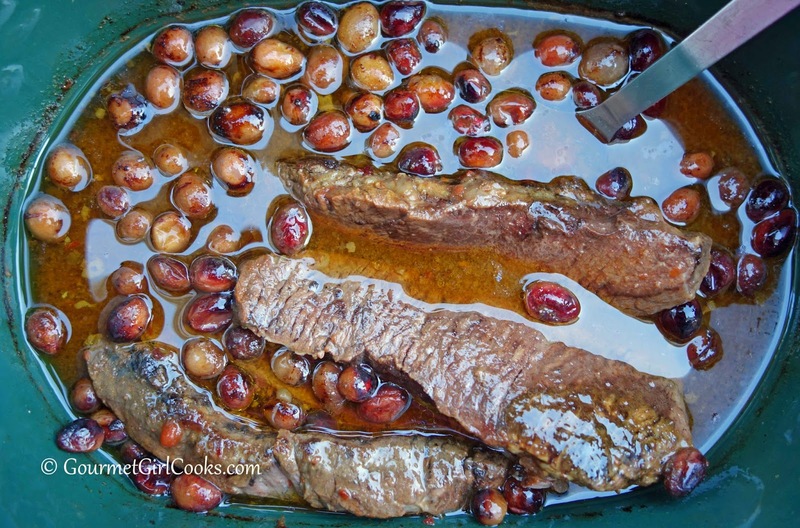 I snapped a few photos and included the recipe below. Enjoy! 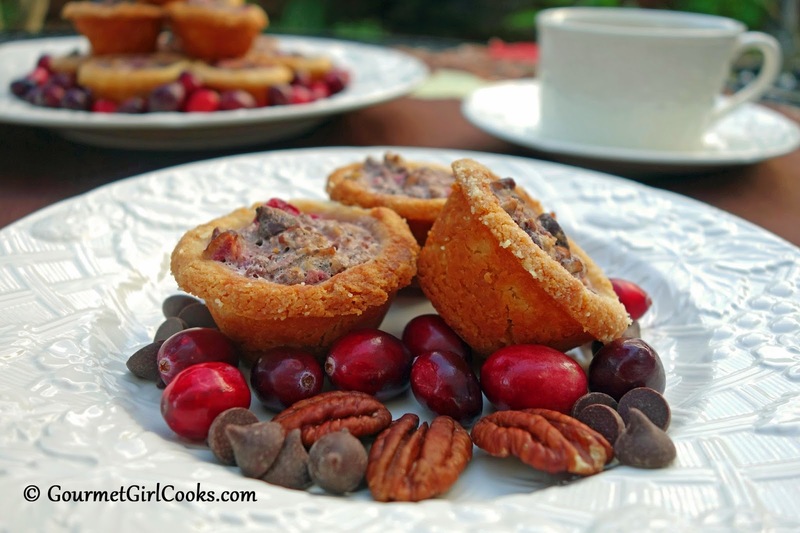 Chocolate-Cranberry Pecan Tartlets - NEW RECIPE ALERT! It's a bright, beautiful FALL day here and only 63 degrees outside at lunch time. Finally, we have a day that actually feels like its supposed to for this time of year. As promised, today I'm going to share my new dessert recipe with you that I created as a guest post for Honevyille. 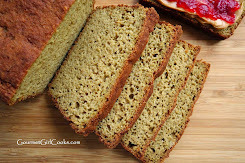 Honeyville's blanched almond flour is my most favorite grain free baking ingredient. 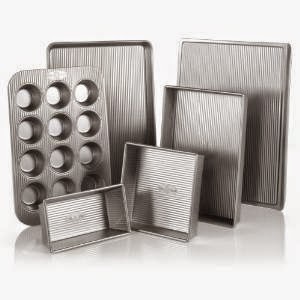 I've been using it for over 2 years now and it's usually at the center of most of my grain-free baking. I love it...period. My new dessert has all the "right stuff" and some of my most favorite flavors...chocolate, pecans, and CRANBERRIES! Yay!!! I am so obsessed with cranberries that it isn't funny! Seriously, I just need to move to Maine and buy my own cranberry bog and be done with it! I would much rather have cranberries in my backyard than grass. Back to my new dessert recipe (I get distracted when talking about cranberries). 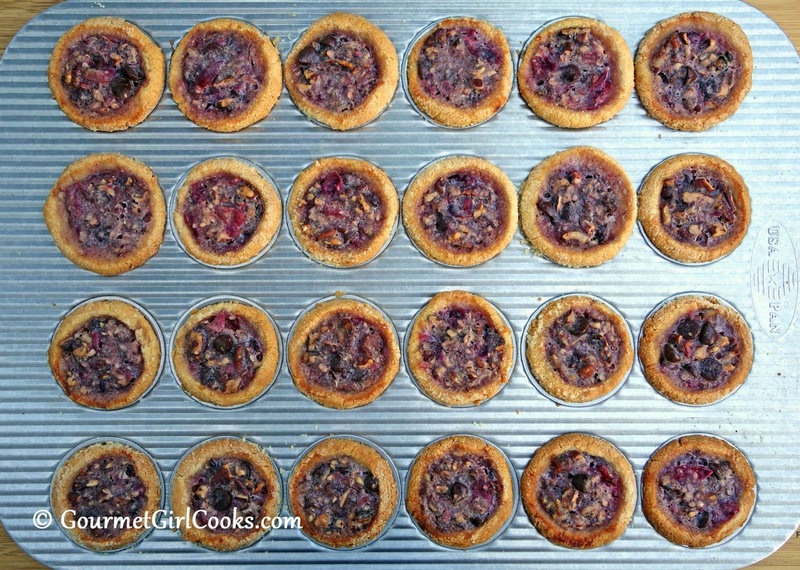 I am excited to debut my Chocolate-Cranberry Pecan Tartlets with you. If you are from the south, they are very similar to pecan tassies, only better. 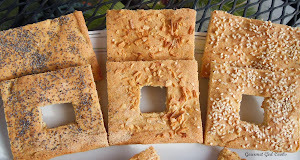 I used Honeyville's blanched almond flour to create the miniature crusts and they turned out tender and beautiful! 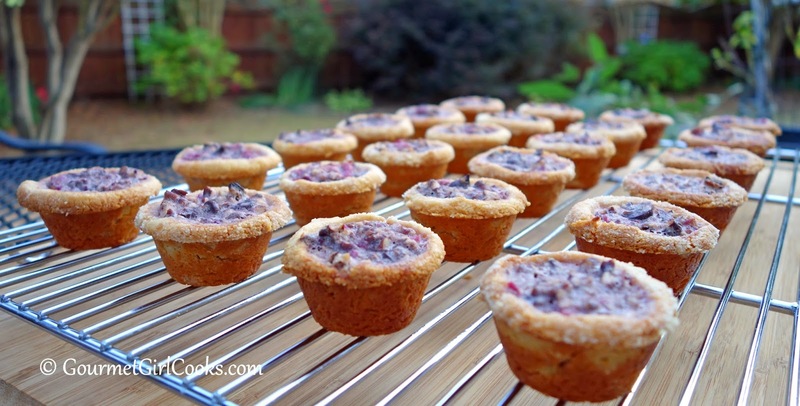 I used my homemade sugar-free Cranberry Orange Sauce as the method to add the cranberries to these little beauties. 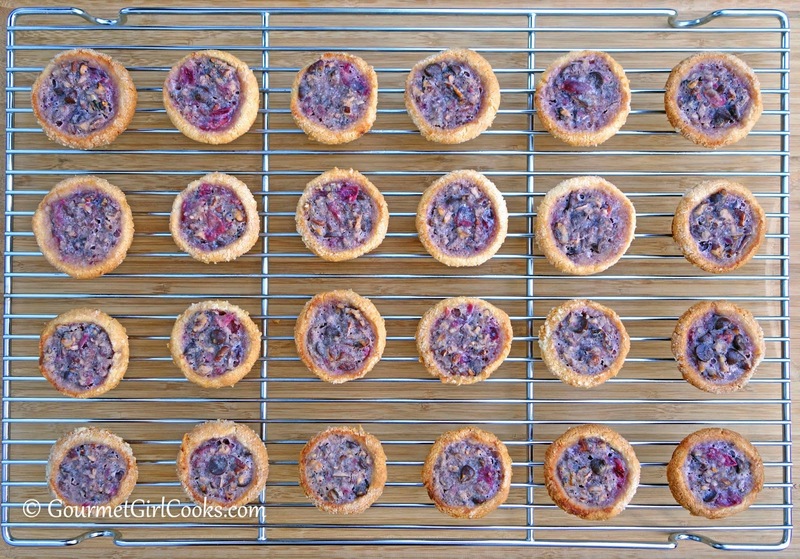 The tartlets are not overly sweet and you get a little burst of cranberry, chocolate and pecan flavor in every bite. 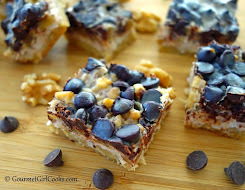 Rather than ramble on and on...I'm going to give you the link to the recipe for these. 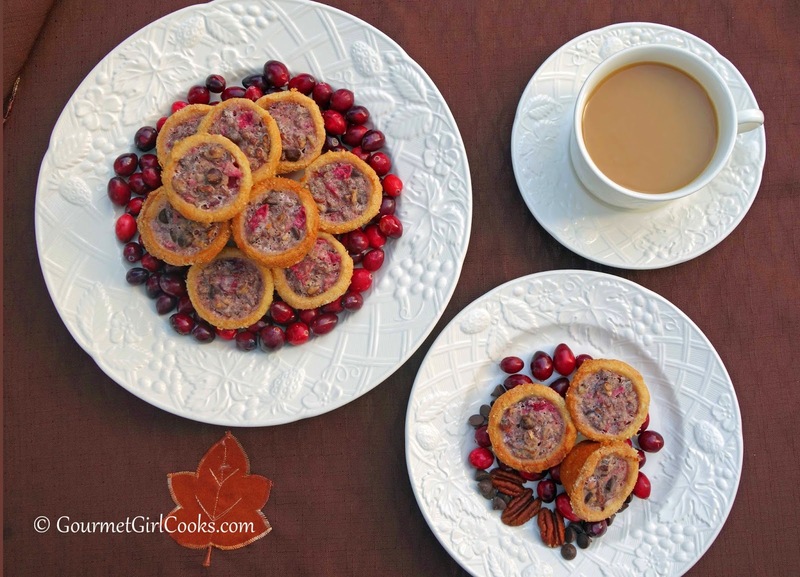 Click this link to get the recipe for: Chocolate-Cranberry Pecan Tartlets. Enjoy! Last night I put some beautiful boneless beef chuck short ribs in my crock pot before going to sleep. It was after midnight when I put them on to cook because I forgot to do it earlier as planned. 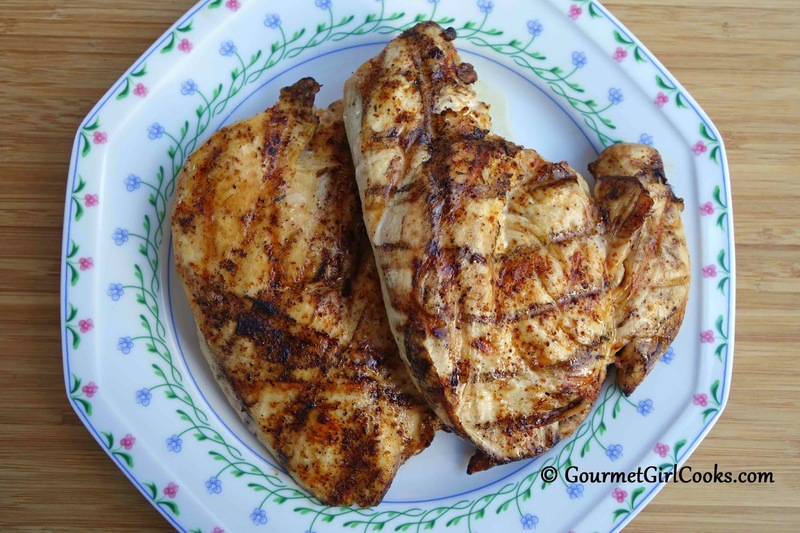 I cooked them on low overnight and all day long today so they were super tender and moist. Honestly, this particular cut of beef I buy from Costco is some of the best I've had. I try to choose ribs that are very meaty and not too fatty. They turn out delicious every single time. 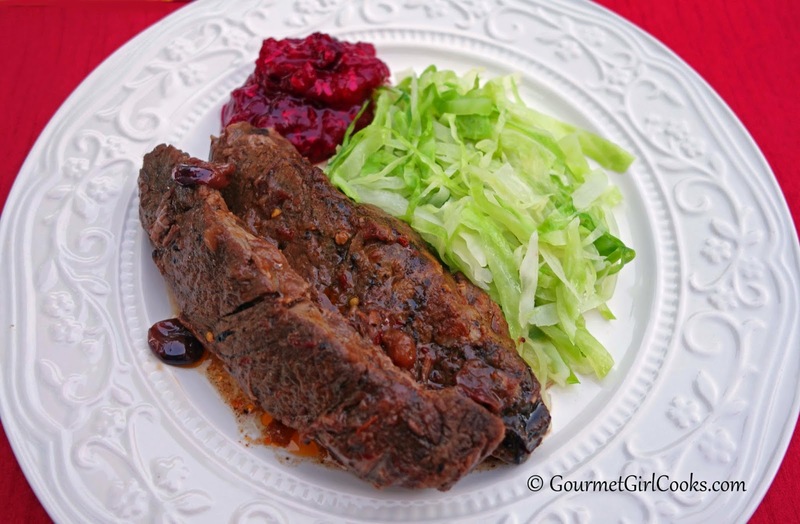 I used my basic recipe for Slow Cooked Boneless Beef Short Ribs and then added cranberries and a bit more sweetener to change them up a bit and because I just absolutely love cranberries! 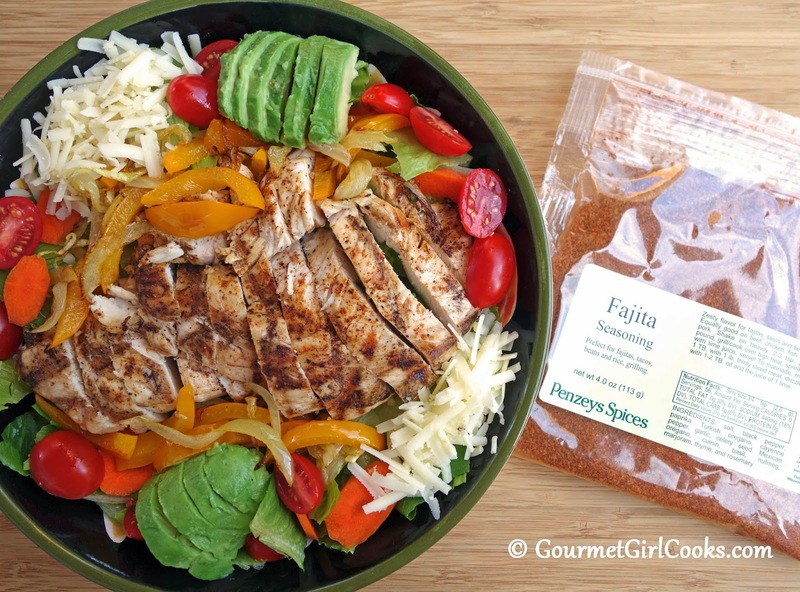 One of the seasonings used in the sauce is ground ancho chile powder. 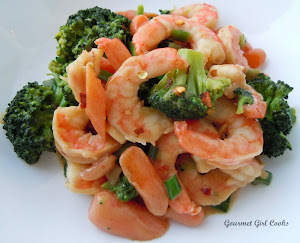 I also added a bit of chili-garlic sauce as well for a little extra kick. I don't make them super spicy but there is a spicy undertone that I balance with a little Swerve sweetener. As I was opening and closing the fridge the big bowl of washed fresh cranberries on the top shelf caught my eye. 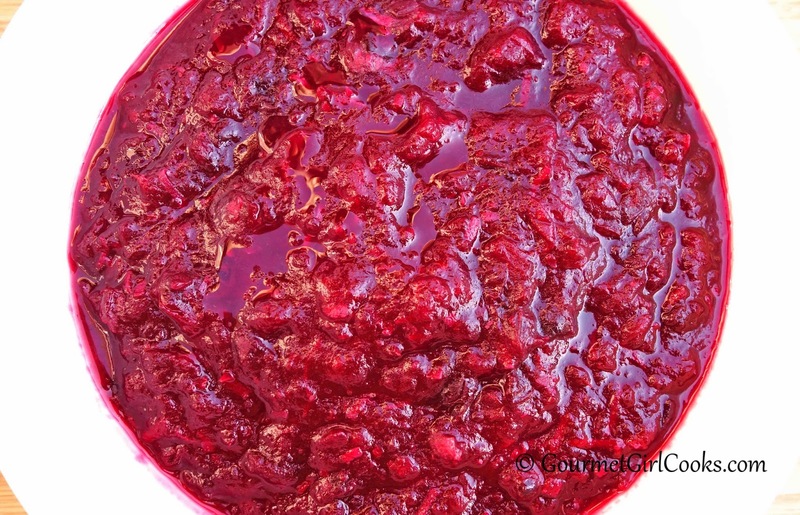 I wondered how adding some cranberries to the crock pot might add some extra zing to the sweet and spicy flavored juices. I decided there was only one way to find out and that was to go for it. I bumped up my sweetener by a couple tablespoons to balance the tartness of the cranberries and whisked it into the sauce before pouring it over the ribs. I measured out a rounded cup of cranberries and scattered them on top of the ribs before covering the crock pot. Then...I did a little happy dance. 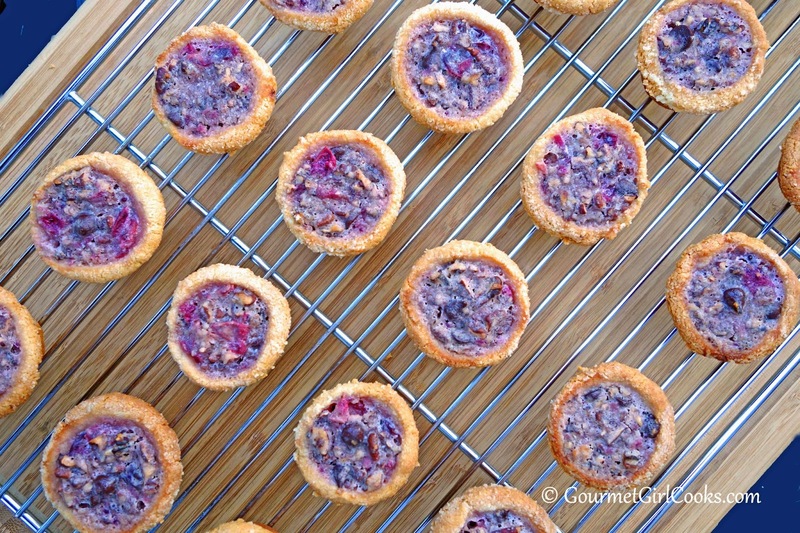 If this turned out good, it would be yet ANOTHER way to enjoy my beloved cranberries. Other than adding a little more sweetener to balance the tartness and bring out the cranberry flavor, the only thing I did differently was to boil down the juices on the stove top for about 15 minutes or so to reduce them by about 1/4. I pressed the cranberries that were floating on top to make sure they had all ruptured which incorporated them nicely into the "au jus." I added another couple tablespoons of Swerve as it was cooking down (one tablespoon at a time, tasting after each addition) and then a pinch of sea salt. The ancho-cranberry au jus was absolutely delicious. 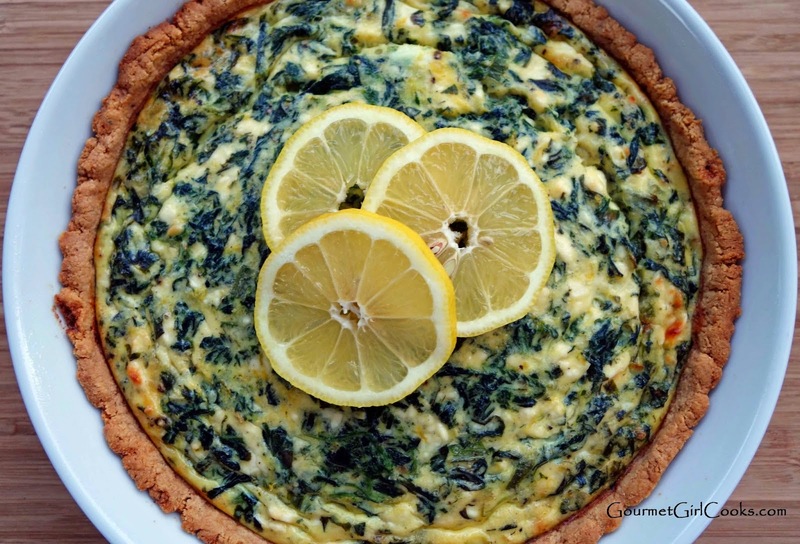 The spicy-sweet-salty-tart flavor was perfectly balanced without either one of the flavors overpowering the other. They complemented each other beautifully. To go along with our short ribs, I thinly sliced half of a small head of cabbage and lightly steamed it with a couple tablespoons of water in the microwave for about 5 minutes just until wilted but still bright green. I drained it and tossed it in a skillet with some butter on medium-high heat for a few minutes and then seasoned it with a bit of sea salt. It was that simple! 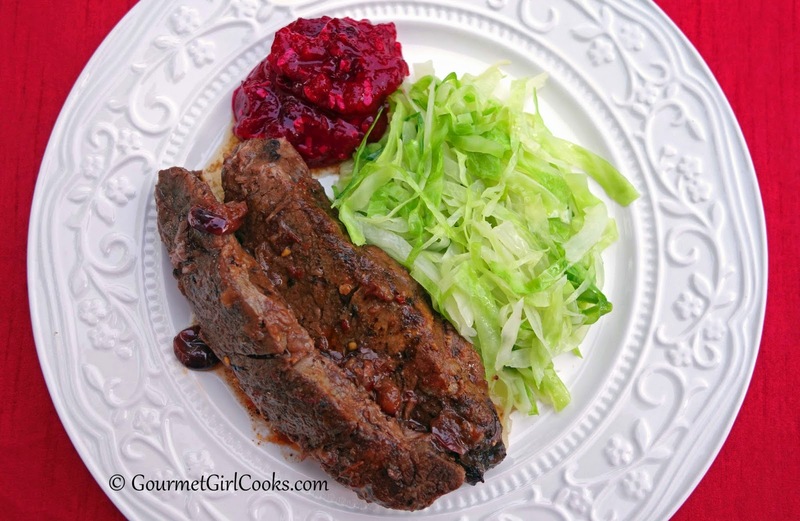 Did I mention that I also served our meal with a dollop of fresh cranberry sauce on the side? 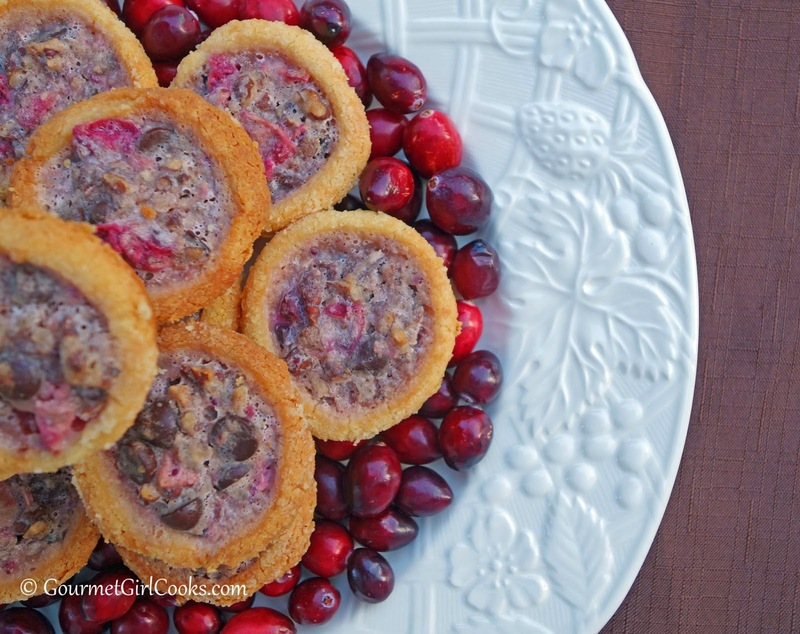 I mean, who says cranberry sauce is just for turkey? I could eat it morning, noon and night! 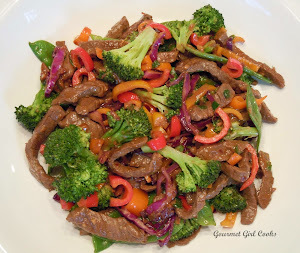 This meal was amazingly simple and amazingly delicious. 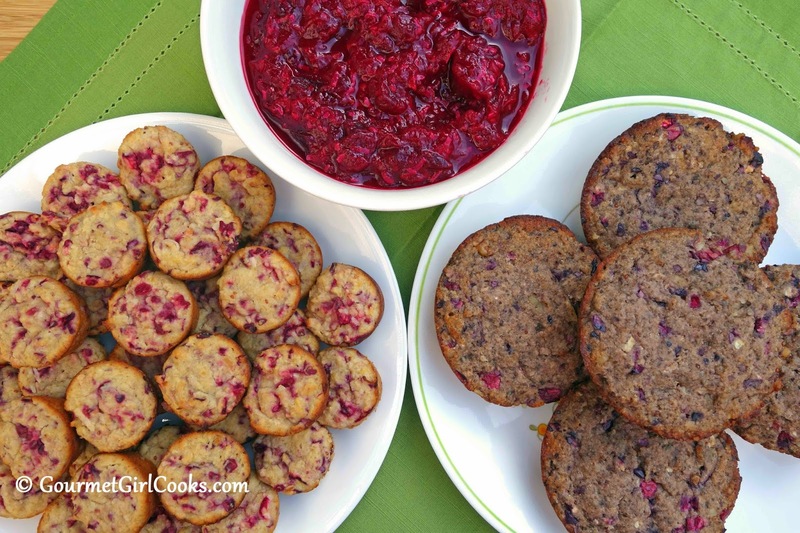 I am so glad I tossed those cranberries into the crock pot last night. 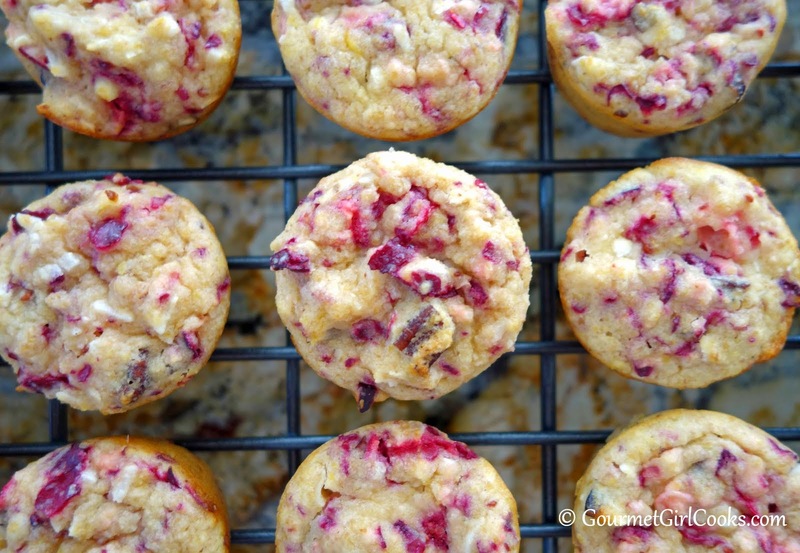 If you love cranberries like I do...try it, you'll like it! Enjoy! P.S. - New dessert recipe alert for tomorrow! You are going to love this one...stay tuned!!! This evening I made a quick and easy dinner because I'm working on another recipe project and I didn't have a lot of time. 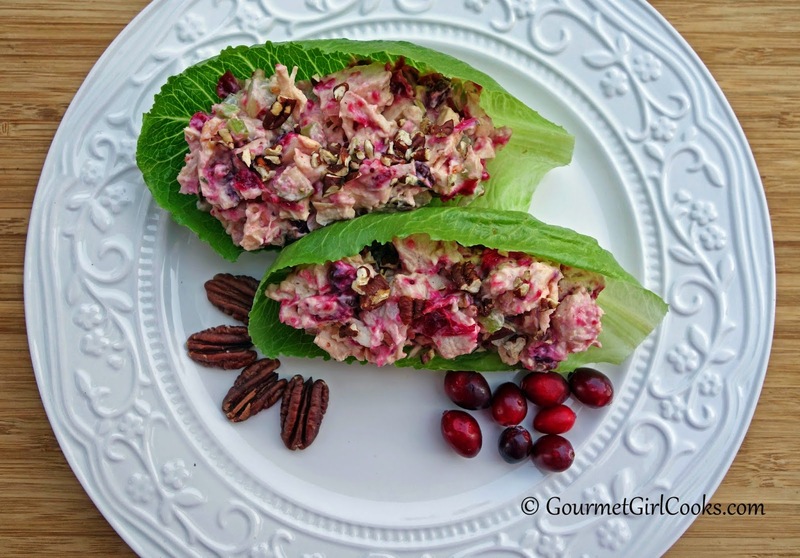 I'm still in full fledged cranberry mode here so I wanted to find a way to wind cranberries into my meal. I actually had one of my Cranberry Walnut Power Bagels with butter and "cranberry sauce jam" for lunch and wanted to enjoy cranberries again with my dinner. I had some leftover cooked chicken in the fridge so I decided to make an autumn version of chicken salad for our dinner. It was so easy to do and so good. 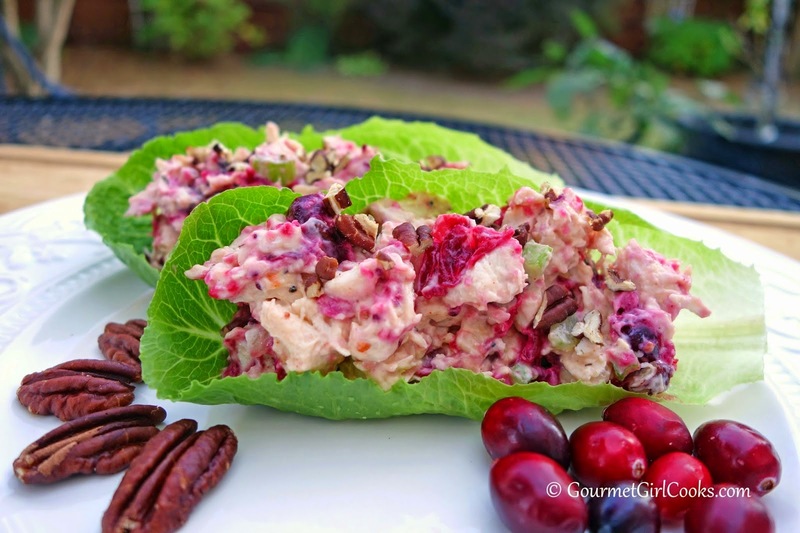 I used my Cranberry Orange Sauce to add cranberries to the chicken salad and it was SO good! 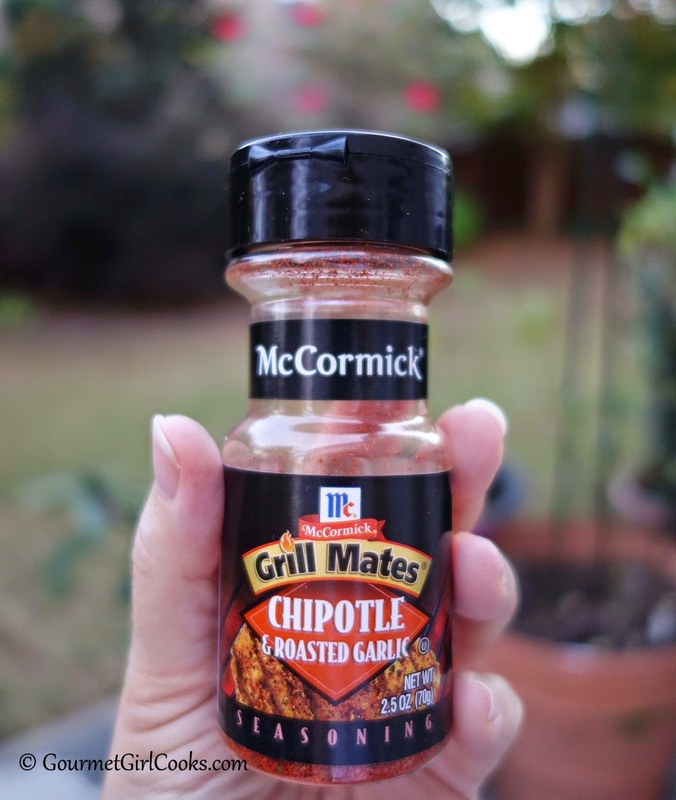 I also added some McCormick Chipotle & Roasted Garlic Seasoning instead of salt and pepper and it added a nice flavor. I figured hubby would turn his nose up to adding the cranberries so I initially separated his chicken salad out before adding the cranberry sauce but he saw mine and said he wanted that too! I served it in crisp little artisan romaine lettuce cups. 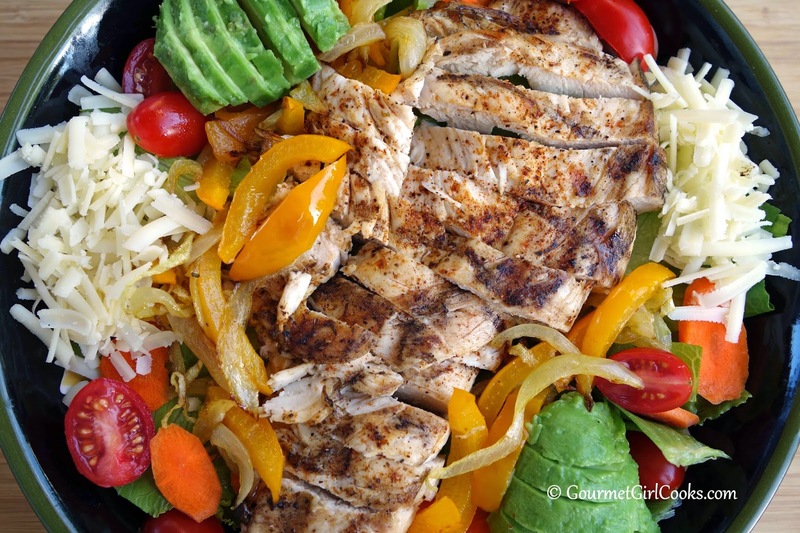 I will definitely be making this chicken salad again. 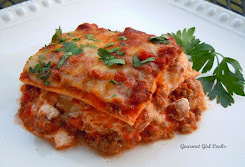 I snapped a couple photos and included the easy peasy recipe for it below. Enjoy! 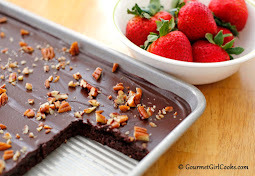 This evening I'm sharing one of the easy dessert recipes that I've made in the last couple weeks. 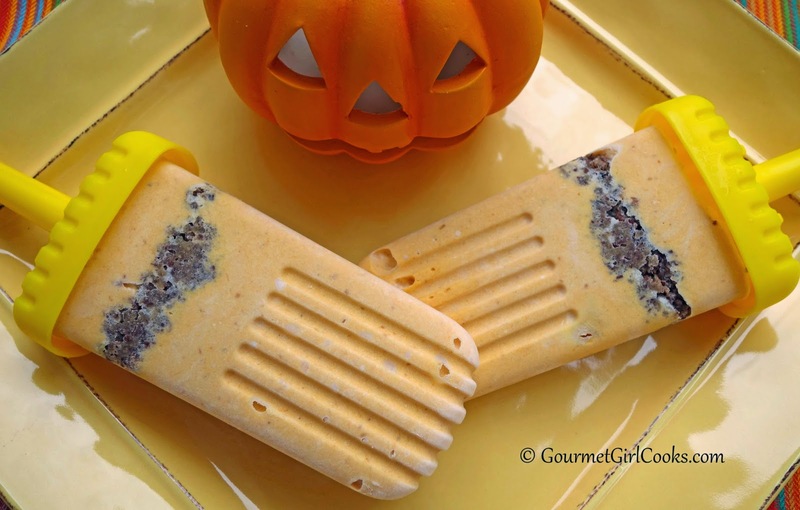 Overall, it's been an unusually warm autumn here thus far, so I decided to makeover one of my Fall favorites into a treat that could be enjoyed year round...Pumpkin Pie-sicles with Cinnamon Pecan Crust. I had initially planned to just make pumpkin pie pops but thought...what's pumpkin pie without the crust? 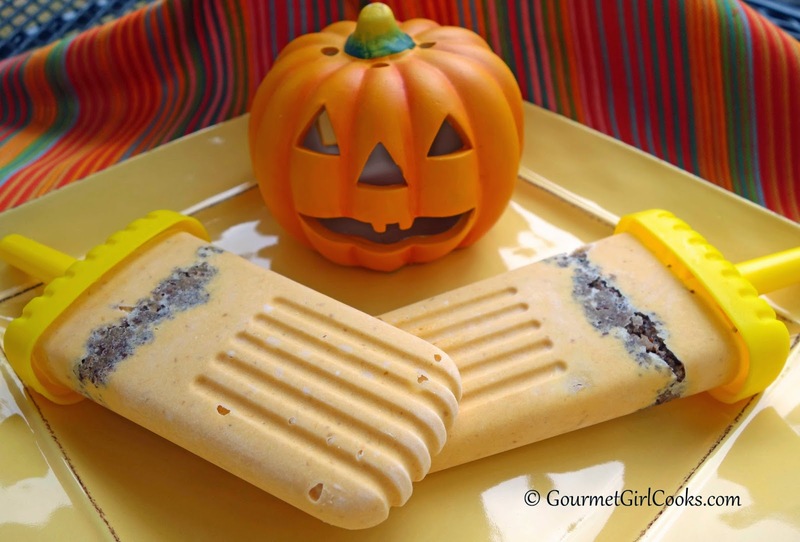 So, I added a simple buttery cinnamon pecan crust layer to these pumpkin pops. 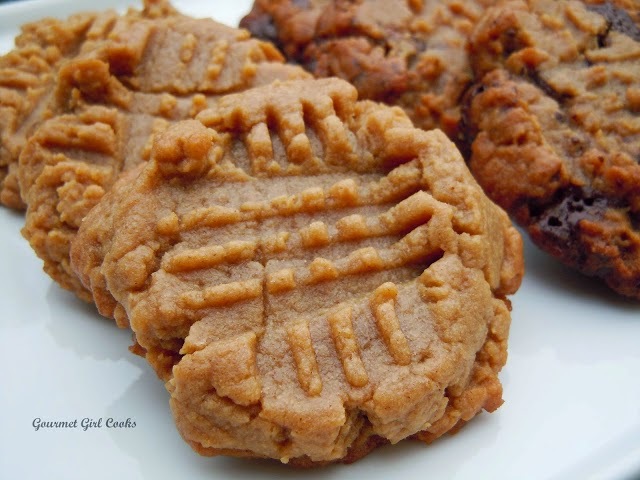 The first time I made them, I used a full 15-ounce can of pure pumpkin but decided it was just a little too pumpkiny (if there is such a thing). I made them again and reduced the pumpkin a bit and liked them better. 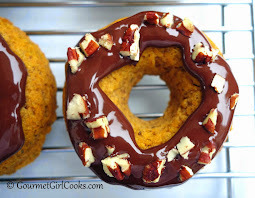 If you aren't sure how pumpkiny you want them, I would suggest starting with 1 cup of pumpkin and tasting as you go, increasing it until it's "just right" for you. One of my favorite things about these pops is the pecan crust! 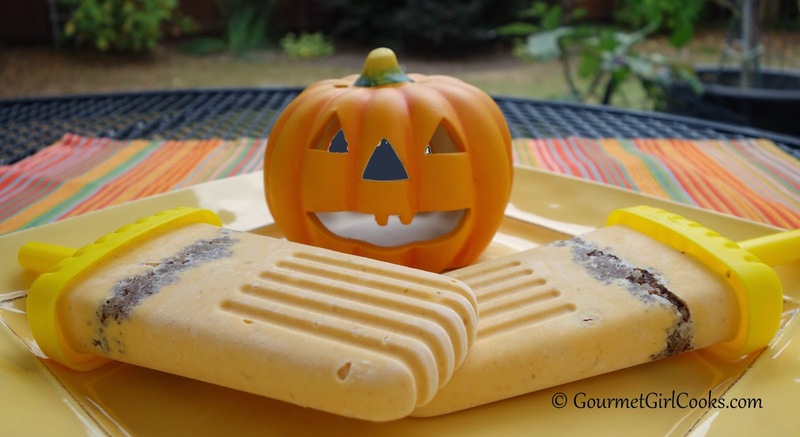 These pops remind me of a frozen ice cream bar version of the the pumpkin pie ice cream squares my mother used to make when I was growing up. She would soften vanilla ice cream and add pumpkin puree and pumpkin pie spices and then pour it into a 9 x 13 pan lined with graham cracker crust and freeze it and then cut it into squares to serve. It was like frozen pumpkin pie. 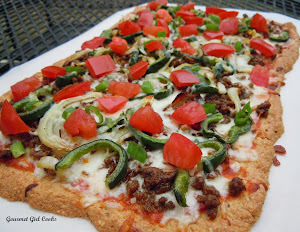 I snapped a few photos and included the easy peasy recipe below. Enjoy! Yesterday I did a lot of cranberry baking. 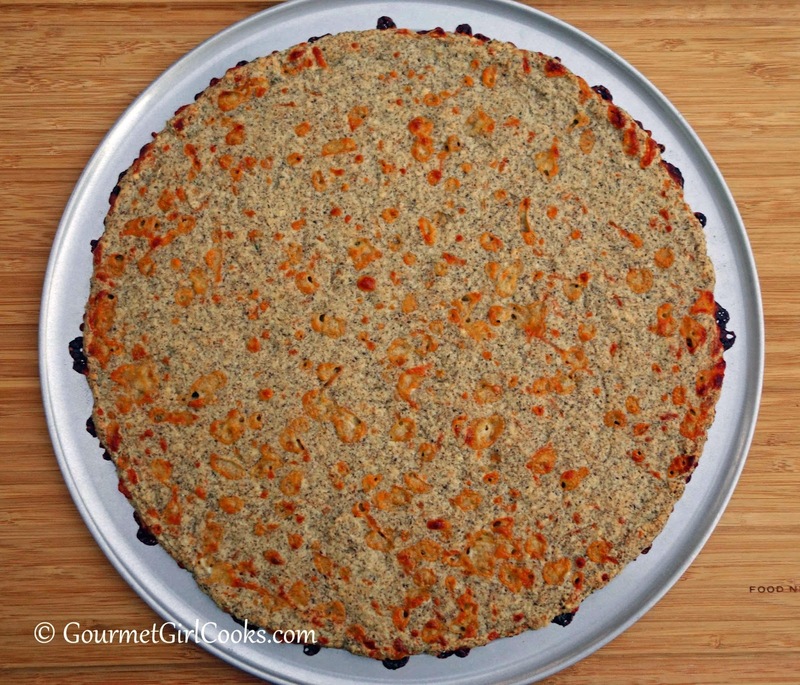 One of the items I made was a fresh cranberry and walnut version of "power bagels" that I used to love eating at Einstein's Bros Bagels before I created my own grain free recipe for them. 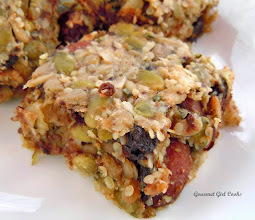 I usually add dried fruit to them with seeds (an antioxidant blend I find at Costco). 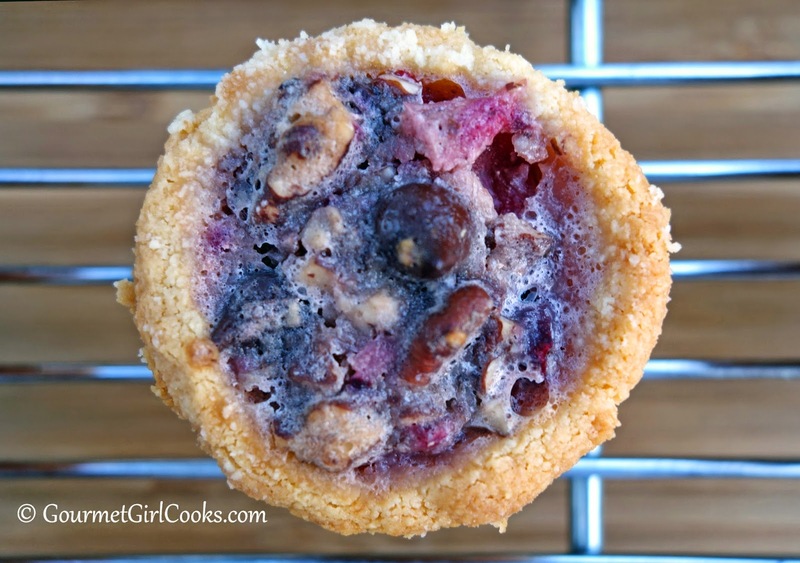 I wanted to see how they would work using fresh cranberries in place of the dried fruits since I love their tart tangy flavor and we're at the beginning of cranberry season. I really liked the tart fresh cranberry flavor of this version. Their a little more tart than the dried fruit version even after I bumped up the sweetener a bit, but I like them that way. 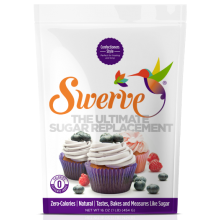 If you prefer yours a little sweeter, you can add a bit of stevia to the batter to your liking. I enjoyed one for breakfast this morning spread with cream cheese and topped with my fresh Cranberry Orange Sauce that I used as the "jam." It was complete cranberry heaven. I've also been working on a couple of other projects as well this weekend. I absolutely loved the one I created today and will share it with you later this week. 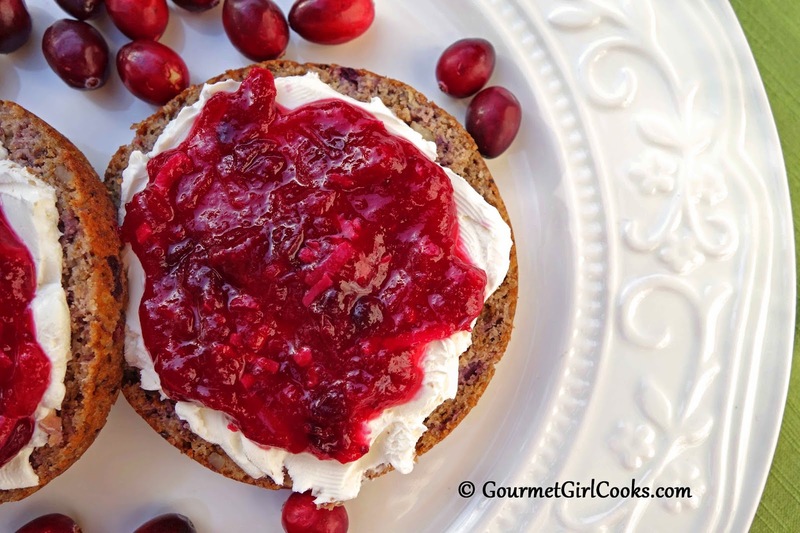 I snapped a few photos of my Cranberry Walnut Power Bagels below as well as posted the recipe. Enjoy!